The glut of September releases gets gluttier this weekend. Three new wide releases find their way to theaters, while one more expands into national release. The search for quality among these films continues, however. Ten, or maybe just five, years ago if you'd heard the title Wall Street: Money Never Sleeps, you'd probably assume you were watching Saturday Night Live. Since then, Oliver Stone went crazy(er) and destroyed his marketability with documentaries favorable to Castro. Thus, we get the return to familiar material, and with the collapse of the financial markets, it's actually somewhat relevant again. But oy, that subtitle. Michael Douglas returns as Gordon Gekko, the role that won him an Oscar, having just been released from a lengthy stint in prison for shady financial doings. Only now he's apparently reformed and on the side of the good guys, trying to alert the world about the impending financial meltdown, like Lex Luthor teaming up with Superman to take down Bizarro. Meanwhile, we have on-the-rise stock trader Shia LaBeouf (no, wait, it gets better), who's dating Gekko's daughter (Carey Mulligan) and seeks him out as a mentor (which is a bit like asking Michael Milken for a job). The jury is still out as to whether people's outrage at the shenanigans of the last couple of years will make them want to see a fictionalized version of it, or whether it might end up like so many Iraq and Afghanistan war films before it, in that the subject is too raw to be treated as entertainment. In other words, you ain't telling us anything we don't already know, Oliver. Aside from one clunky, albeit effective joke in the trailer about technology change since the 1987 original film, Wall Street 2 looks like a dour trip down memory lane. The last film of any significance in the box office department for Douglas is The Sentinel, which you've almost certainly forgotten about (something about the First Lady and stuff), and his last hit was Don't Say A Word, which had the benefit of one of the more whacked out ad campaigns of the decade. He's had several supporting roles in the midst of those, but we can hardly count those. LaBeouf is the bigger wild card here – although he remains one of the more punchable celebrities in Hollywood, he has a ridiculous resume of blockbusters, which appears to be carrying over into his non-franchise films. You've got to have some draw to open Eagle Eye to nearly $30 million. I think this will end up being just intriguing enough to get audiences in the door to around $23 million. Zack Snyder is racking up one of the strangest resumes in Hollywood. Starting as a music video director, he broke out with the remake of Dawn of the Dead, and then achieved A-List status with 300 and Watchmen, both of which broke the $100 million mark and entered the culture as touchstones. For his next trick... owls? 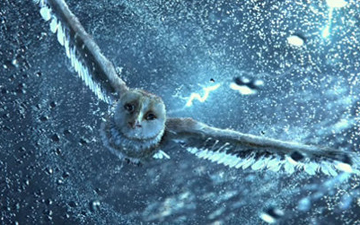 Legend of the Guardians: The Owls of Ga'Hoole is an allegedly popular children's novel series about owl that do battle and stuff. Owls, really? That's what we're going with? Okay... Anyway, it's a big, rousing adventure film in 3D with a very lush look and a unique-enough style that it'll probably serve youthful audiences quite well in the absence of anything else out there. It should also join the company of some other mid-tier childrens' films that I know next to nothing about, like Bridge to Terabitha and The Golden Compass, with about $18 million.